An answer commonly given to the question of who was the first black man to play major-league baseball is still Jackie Robinson in 1947. Knowledgeable baseball people know that Robinson was preceded by the Walker brothers, Moses and Weldy, for Toledo in 1884. Recent research, led by SABR’s Peter Morris, has uncovered evidence of still earlier African American participation in the major leagues. Morris’s detective work reveals that William Edward White, a former slave, had a one-game career for the National League’s Providence Grays on June 21, 1879. White had come north from his native Milner, Georgia, to attain his education.1 He was a student at Brown University and a member of the school’s crack baseball team, which had just claimed the college championship of 1879.2 He was, no doubt, known to the professional club that shared the same city and ballpark and which had faced the Brown nine in several early-season games that year. When the Grays’ regular first baseman, “Old Reliable” Joe Start, “broke the second finger on his left hand”3 during the Grays game of June 19, White was pressed into service as his replacement. Though he played well, he was replaced, in turn, by Jim O’Rourke, the Grays’ regular right fielder, for the remainder of Start’s absence. The Grays were a very strong club that included future Hall of Famers O’Rourke, player-manager George Wright, and John Ward, and stood second to Chicago in the National League standings in what would be a pennant-winning season for the Rhode Island team. The Clevelands rested in the cellar on White’s career day. After falling behind early, Providence rallied for a 5–3 win as the 19-year-old Ward notched one of his 47 victories that season. For his part, Bill White “played first base in fine style.”4 The Providence Journal wrote of his play at first base in the game, “White, first baseman of the University Nine, occupied that position for Providence, and it is needless to state that he was as expert and effective, as ever, catching some widelythrown balls with great ease. He was apparently cool and collected throughout and will be a valuable substitute for the unfortunate [injured Joe] Start.”5 The Providence Morning Star commented on his offense and the support of his Brown University teammates, “The Varsity boys lustily cheered their favorite at times, and howled with delight when he got a safe hit in the ninth inning, as they also did his magnificent steals of second in that and the fifth inning.”6 He had a single in four at-bats and the two stolen bases, scored a run, and played errorless ball, recording 12 putouts. The Providence Journal article, discussing the upcoming series with Boston, wrote that “White has been engaged to cover first in the series.”7 This did not come to pass and, for reasons undetermined except by speculation, William Edward White never again played in the major leagues. 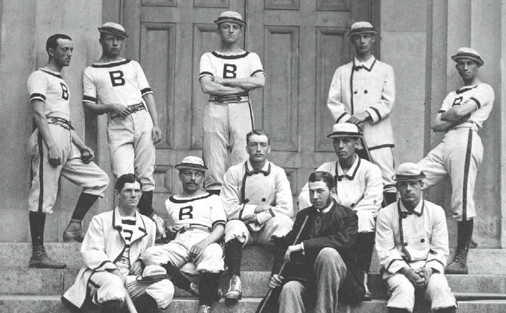 He did continue to play for Brown through the fall 1880 season and subsequently left school without graduating. Other than census reports, no known contemporary record made after White moved north contains reference to his race. These records include those at Brown University and newspaper accounts of the Grays’ game in which he played. In the 1880 Federal census he identified himself as a 19-year-old white student born in Georgia and living in Providence. Research by W. Zachary Malinowski, a Providence Journal investigative reporter, has shown that White attended the Friends Boarding School in Providence before enrolling at Brown. Malinowski found an undated White record there that included a Chicago address for him. Morris did followup work and found White in Chicago in both the 1900 and 1910 federal censuses where, in each case, White again declared his race to be white. 2. Richmond, J. Lee. “Beating Harvard and Yale in Seventynine,” Memories of Brown (Brown Alumni Magazine Company: Providence Rhode Island, 1909), p. 364. 3. New York Clipper, June 28, 1879, p. 107. 5. Malinowski, W. Zachary. 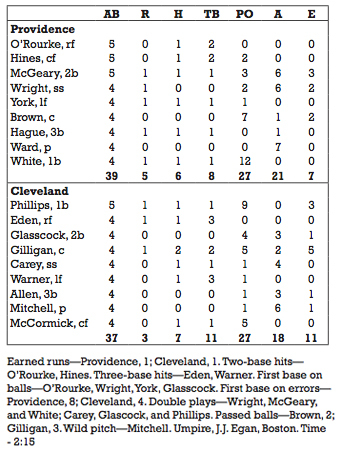 “Who was the first black man to play in the major leagues?” Providence Journal, February 15, 2004, p. A-1. 11. New York Clipper, June 28, 1879, p. 107.